It is finally available for consultation and download our brand new Catalog Update April 2019. Spring is the season of rebirth and renewal. To celebrate it, we decided to update our catalogue with rich and exciting news. Preparation and cooking lines are thus enriched with new products: from the hand blenders, multi-function and with “Feelspeed” command, to the colorful mixers, a two-speed table blender with excellent power and, to enjoy an excellent homemade natural ice cream, an ice cream maker suitable for the needs of the whole family. We also introduced two Petravera contact grills of large and medium size together with a compact one equipped with non-stick plate; a new 38-litre convection oven, and the lunch box Vivandiere 2in1, now working also at 12 volts. 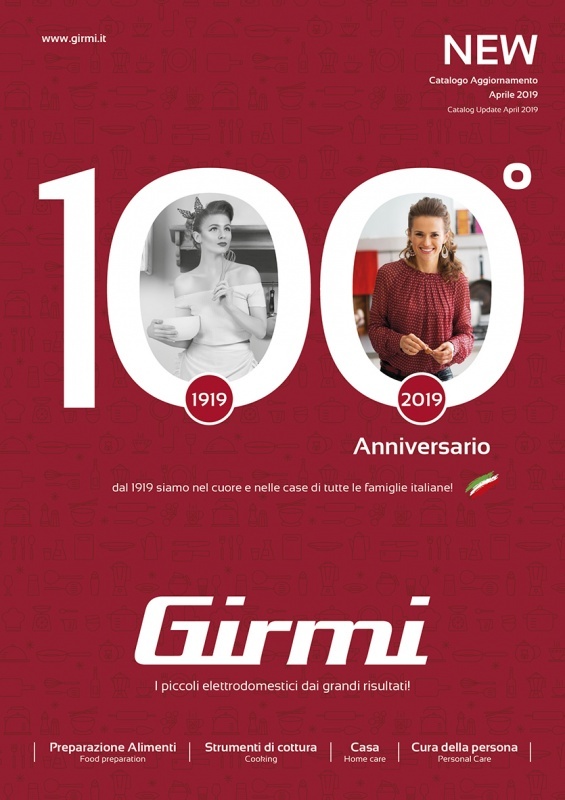 The catalogue is completed by a practical portable wet & dry vacuum cleaner and the hair dryer Retrò 50 with vintage and attractive design. Download "Low Res GIRMI Agg. Aprile 2019"